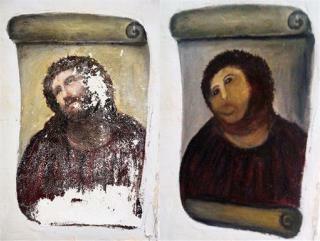 (Newser) – The astoundingly botched "restoration" of a 19th-century Spanish fresco featuring Christ has become a hit with tourists—and now even has its own Twitter account ("once a handsome fresco, now a hedgehog," guffaws the parody profile). The horrible paint job by a well-intentioned elderly parishioner at a Borja church has created a work more popular than the original. Hordes of visitors are streaming to get a glimpse of the mangled art that looks like a "crayon sketch of a very hairy monkey in an ill-fitting tunic," in the judgement of the BBC. He looks uncannily like an Alpha Centauri. I fear someone may have blown the cover on our mission. Still looks like a kiwi fruit, or a hairy crabapple with eyes, to me. At least, the old lady tried. Those in charge were doing nothing about it before she acted.